On this Saturday, the Eifel again showed itself from its most beautiful angle: in bright sunshine, the Mercedes-AMG GT3 encountered perfect conditions at the Nürburgring-Nordschleife. In the process, the HARIBO Racing Team Mercedes-AMG secured second place overall after four hours and 28 laps. Starting driver Uwe Alzen (GER) showed his entire ability in the Green Hell and already managed to make up two positions, moving up into second place at the start of the four-hour race. During his stint, the stalwart staged a thrilling battle for the lead and was able to take this for the first time on lap six. As the race went on, his team-mate Maximilian Götz (GER) also drove the Mercedes-AMG GT3 with starting number #8 masterfully through the dense traffic with over 190 competitors. The legendary starting number #8 racked up some miles in the lead at the 24.358 kilometres long VLN configuration of the Eifel circuit. Lance David Arnold (GER) kept his team in the battle for victory until the final pit stop and with 45 minutes remaining, he handed the car again to his team-mate Maximilian Götz. In a thrilling showdown that saw the three leading cars complete the final laps only seconds apart, the HARIBO Racing Team Mercedes-AMG eventually crossed the finish line in second place overall, only 4.533 seconds down on the winners. 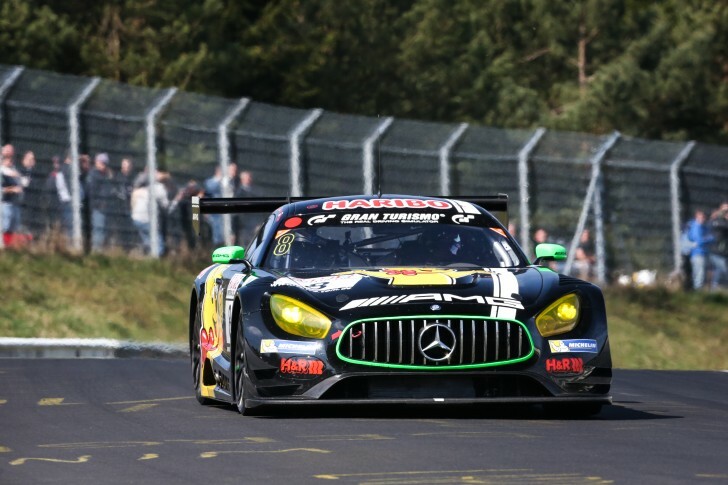 The Mercedes-AMG Team BLACK FALCON entry with starting number #6 emerged as the second-best Mercedes-AMG GT3 at the Nürburgring-Nordschleife. The trio of Yelmer Buurman (NED), Adam Christodoulou (GBR) and Manuel Metzger (GER) finished in eighth place while the Mercedes-AMG Team HTP Motorsport with Maximilian Buhk (GER), Edward Sandström (SWE) and Edoardo Mortara (ITA) followed immediately behind in ninth place. The #47 HTP Motorsport Mercedes-AMG GT3 had managed to work his way up from 23rd place on the grid to finish in the top ten.